You've probably never thought too much about saliva except for the times that it's been absent. If you've ever experienced chronic dry mouth, it can become painful and debilitating, affecting taste and speech. 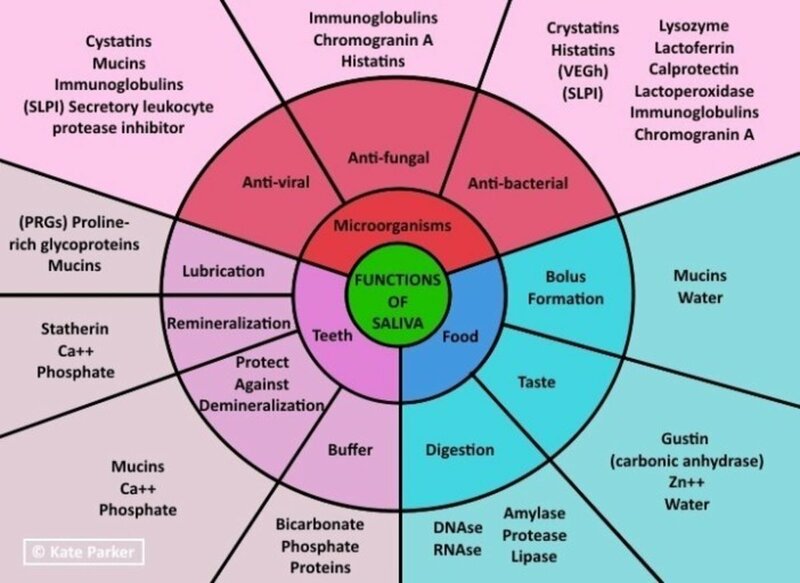 Apart from lubrication, saliva is key to digesting carbohydrates and fats, fighting infection in the mouth and body, protecting and remineralizing the teeth, and many other important functions. This crash course should give you the basics of why it's important to have adequate saliva, with solutions at the end in case you suffer from chronic dry mouth. Even if you don't have a chronic dry mouth, learning about the importance of saliva is key to understanding dental health. Saliva is a mixture that is secreted out of salivary glands in the mouth. There are major and minor salivary glands, with different glands producing different types of saliva. 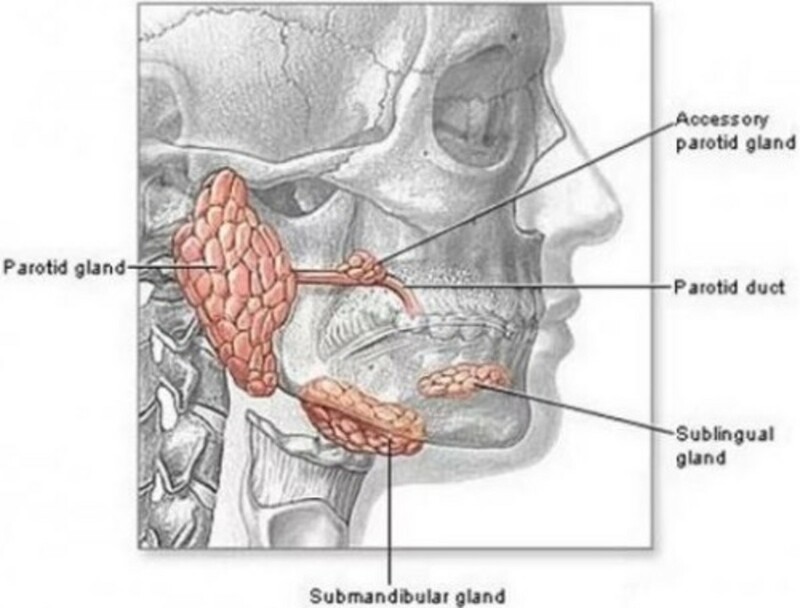 Each gland's secretions contribute to the overall fluid in the mouth that we call saliva. Saliva's pH is generally between 5.75 - 6.75, slightly acidic. With an alkaline diet, however, saliva can cross into the 7.0 - 8.0 pH range and has an increased buffering capability. Buffering the Teeth and Oral Cavity - a low (acidic) pH in the mouth is responsible for the development of dental decay. Saliva bathes the teeth in crucial minerals, buffering acids and increasing the overall pH. Remineralization of Tooth Enamel - teeth are continuously bathed in calcium phosphate ions, a key component in tooth structure. While acids can erode these minerals, saliva excretes them into the oral cavity to help prevent decay. Digestive Enzymes - pre-digestion begins when saliva mixes with food in the mouth. Salivary enzymes begin to break down carbohydrates, fats, and proteins. Antibacterial and Antibiotic Properties - specific (IgA) and non-specific (lysozyme, lactoferrin, peroxidase) immunologic actions in saliva help prevent the build up of microorganisms in the mouth. These organisms are responsible for dental decay and gum disease. Lubrication - saliva protects the oral tissues from mechanical damage (scraping, grinding, gouging) when speaking, eating, and swallowing. Speech - it becomes difficult and painful to speak with a dry mouth. Taste - saliva is the liquid medium through which chemicals are introduced to the taste receptor cells (taste buds.) Without saliva, all foods taste the same. 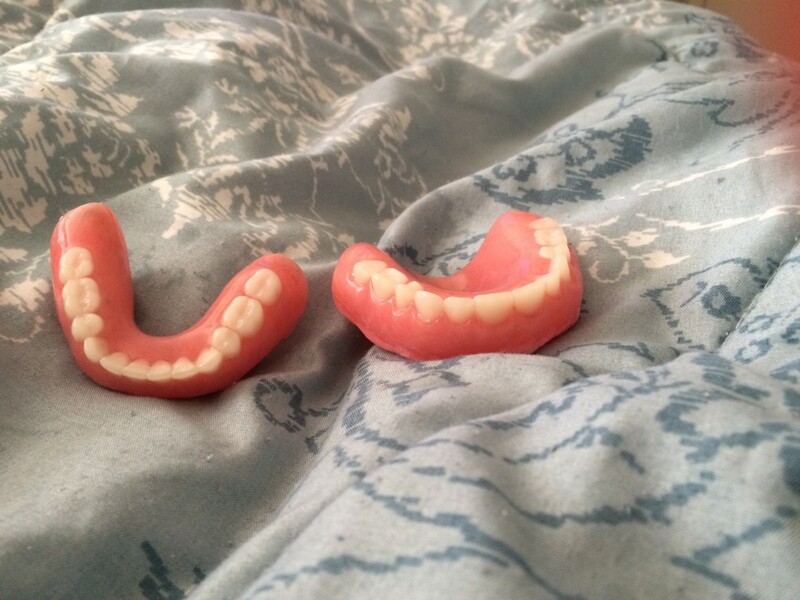 Denture Retention - it's difficult for dentures to suction to the gums without moisture. People with chronic dry mouths often have trouble retaining their dentures. 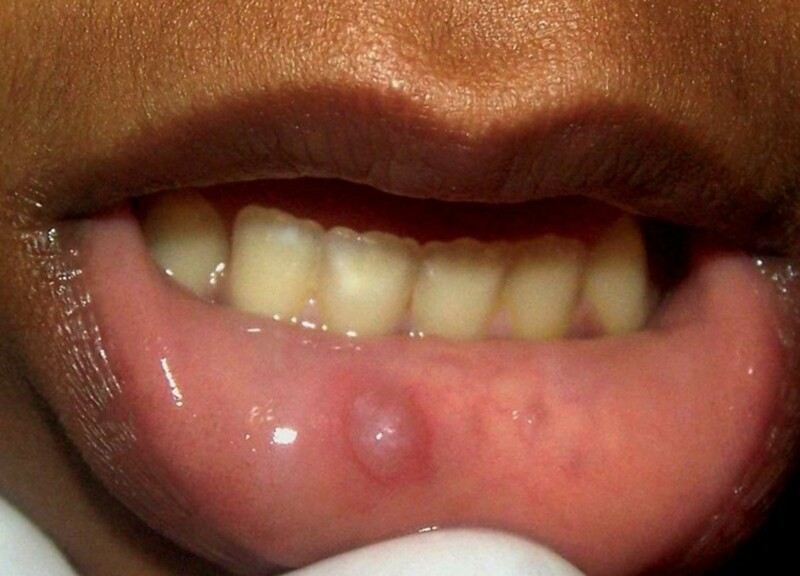 One of the most overlooked dental problems is the chronic absence of enough saliva in the mouth (xerostomia.) This is mainly caused by medications, radiation therapy, and Sjögren's syndrome. Other reasons for xerostomia include mouth breathing and dehydration. Maintaining adequate saliva in the mouth is one of the most important steps to maintaining oral and systemic health. Its absence often has dire consequences, including rampant tooth decay and eventual complete exfoliation (loss) of teeth. With the stunning rise in medication use worldwide, chronic dry mouth has reached an all time high. That said though, dry mouth remedies are more widely available than ever before. Many people use oral lubricants (also known as saliva substitutes) to help restore moisture and minerals to the mouth. Oral lubricants come in the form of toothpastes, mouth rinses, lozenges, and convenient sprays. In my experience most people tend to use a combination of products to get adequate relief. Finding the products that work for you personally can be daunting, but they can make the difference between enjoying life, conversation, and food—or not. Trial and error will eventually lead to the right combination of products for you. However, the most popular products are listed below. 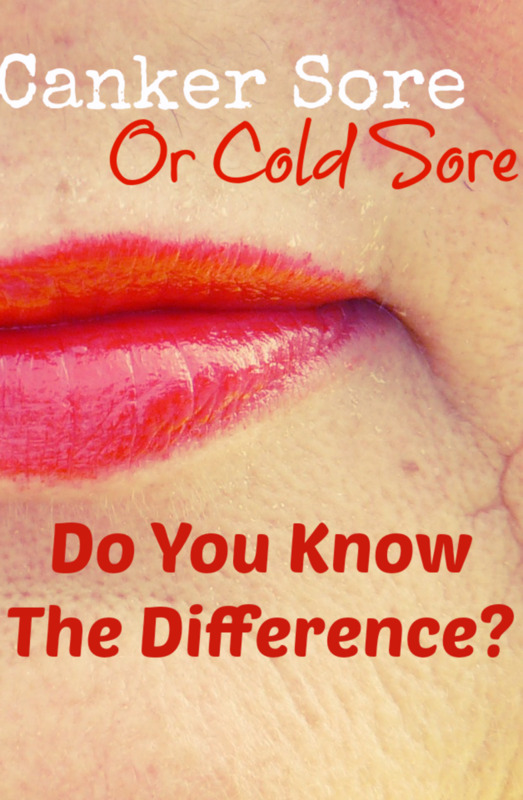 Do You Suffer from a Chronic Dry Mouth? @Rajan Singh Jolly, You're welcome! I think it's a topic most people don't know much about. It's so important to oral and systemic health! Thank you for sharing such useful information about saliva. @Malik Yousaf, Thank you.. I'm glad you found it informative! Nicely written, easy to read and very informative. Thanks for sharing.